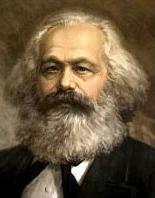 The German philosopher Karl Marx (1818-1883) was one of the most influential political writers in history. Indeed, in the last half of the twentieth century, almost half the people in the world lived in countries governed by principles based on Marx's work. To understand the scope and importance of Marx, we must look to his childhood and to the political situation of his time. Marx grew up in a learned family that prized education. In fact, he came from a long line of rabbis on both sides of the family. In 1835, at the age of 17, Marx went to the University of Bonn to study law. However, Marx's father felt his son should go to a more serious school so, a year later, Marx was sent to the University of Berlin where he studied for four years. "...But the chief guide which must direct us in the choice of a profession is the welfare of mankind and our own perfection. It should not be thought that these two interests could be in conflict, that one would have to destroy the other; on the contrary, Man's nature is so constituted that he can attain his own perfection only by working for the perfection, for the good, of his fellow men. If he works only for himself, he may perhaps become a famous man of learning, a great sage, an excellent poet, but he can never be a perfect, truly great man." I have quoted from this letter at such length to show you that Marx was much more than a political philosopher. As he grew older, he developed into a highly educated economist, a historian, a social scientist and, eventually, a revolutionary. Up to now, Marx had looked at the study of the law only as an academic pursuit. However, "Rheinische Zeitung" was an outlet for the region's middle class and intellectuals, people who were strongly opposed to Prussian authoritarianism. As editor, Marx was obliged -- for the first time in his life -- to confront legal and political issues from a practical viewpoint. This led him to turn his attention to economics and, within a short time, he began to develop a progressive, anti- authoritarian philosophy. In November of 1842, Marx met Friedrich Engels, a German writer who was visiting the newspaper on his way to England. Marx and Engels began to collaborate, the start of a fruitful and stimulating partnership that was to last the rest of their lives. Under Marx's guidance and Engels' influence, the newspaper became more and more radical. In March 1843, Marx was forced to resign and, two weeks later, the Prussian government closed down the paper. Marx then traveled to Paris, where he became involved with working-class, socialist groups. At the end of 1844, he was expelled from Paris, and he and Engels went to Brussels, where they stayed for three years. During this interval, Marx devoted himself to an intensive study of history, developing a materialistic conception of the field. In doing so, he took a very important philosophical step. At the time, European metaphysics was dominated by Hegel's philosophy of idealism, based on two ideas. First, that reality is a creation of the mind; second, that history can be explained as an eternal struggle between opposing spiritual forces, a concept known as the Hegelian dialectic. According to Marx, people make social decisions solely in response to their economic needs. Thus, over time, the characteristics of a society are determined by its economic structure. These ideas served as the basis of a complex political doctrine that came to be called Marxism. Briefly, Marxism holds that the history of society is best-understood as "the history of class struggle". In the same way that the old feudal nobility was replaced by the bourgeoisie (that is, the capitalist class), the bourgeoisie itself will, one day, be replaced by the proletariat (the working class). In a capitalist system, the bourgeoisie is able to flourish because it extracts surplus profit from the products produced by the proletariat. However, capitalism has inherent contradictions, fatal weaknesses that, over time, become more and more severe. Eventually, the proletariat will become so impoverished that they will revolt and take control of the means of production, resulting in a completely classless society. Once this happens, the oppressive, coercive capitalist state will be replaced by a society based on rational economic cooperation. While living in Brussels, Marx and Engels joined a newly formed organization of German emigre workers. The organization was based in London and called the Communist League. At the end of 1847, Marx and Engels traveled to London for a Communist League conference, where they were commissioned to write a "succinct declaration" of the organization's principles. The result, published in 1848, was "The Communist Manifesto", arguably the single most influential political statement in history. Within the Communist Manifesto, Marx applied the concepts of dialectical materialism, asserting that social reform -- "the triumph of the working class" -- was not only desirable, but inevitable. In May 1849, Marx was once again exiled. This time he moved to London, where he would live for the rest of his life. During this time, Marx did a great deal of writing and political organizing. In the 1850s, he studied political economics and wrote weekly articles as a foreign correspondent for the New York Daily Tribune. In 1857, he produced an 800-page manuscript called "The Grundrisse" (Outlines), which was not published until 1941. In the 1860s, he wrote three large volumes, "Theories of Surplus Value", in which he discussed theories of political economics. And in 1864, he and Engels helped found the International Workingmen's Association. From 1867 to 1894, Marx created his greatest work, a three- volume treatise called "Das Kapital" ("Capital"), in which he used Dialectical Materialism to analyze and explain economic and social history. The first volume was published in 1876, and Marx worked on the other two for the rest of his life. On March 14, 1883, Marx died. At his funeral, he was eulogized by Engels: "Fighting was his element. And he fought with a passion, a tenacity and a success such as few could rival... Though he may have had many opponents, he had hardly one personal enemy. His name will endure through the ages, and so also will his work." After Marx's death, Engels edited and published the second and third volumes of "Das Kapital". "It is absolutely impossible to transcend the laws of nature. What can change in historically different circumstances is only the form in which these laws expose themselves."